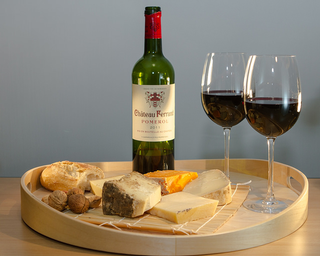 Traditionally, the wine to drink with a bit of cheese was always a red wine. But tastes have changed, and nowadays you can find lots of recommendations for white wines to drink with cheeses. Those recommendations — all of them — are based on personal opinion, what one person likes or finds enjoyable. There’s nothing wrong with that, of course. Most recommendations are just that. But I was somewhat surprised to learn that although there have been lots of studies of how expert tasters describe not oney wine or cheese but just about anything, until now there has been almost no research into how the taste of one thing affects another. A recent paper in the Journal of Food Science asked how cheese affects the taste of wine, using a technique called temporal dominance of sensation, which is itself a fairly new approach to describing taste and especially how it changes over time. As it happens, the conclusions of this scientific study mostly mirror recent advice: white wine is usually a safer choice. I spoke to Mara Galmarini, the researcher behind the paper and to Edward Behr, editor of the Art of Eating newsletter, who has been a long-time champion of white wine with cheese. Mara Galmarini’s paper, with colleagues, is Use of Multi-Intake Temporal Dominance of Sensations (TDS) to Evaluate the Influence of Cheese on Wine Perception. Edward Behr’s Art of Eating newsletter is, in my view, indispensable. If you haven’t already heard it, may I suggest you pair this episode with a much earlier one: An Italian wine education. EarbudsPodCollective mentioned this on twitter.com. A new technique for asking how one taste affects another confirms a recent change of opinion. White wine is often a better choice than red to accompany cheese.